"We agreed an 18-month contract with a break clause at the end of the season and we have now exercised that option," said Spurs chairman Daniel Levy. Sherwood told Sky Sports News, after the announcement: "It is obviously a massive wrench to leave a club of the stature of Tottenham Hotspur, a club very close to my heart." His final game in charge was the 3-0 victory over Aston Villa on the last day of the Premier League season and he claimed afterwards that he would have earned a top-four spot had he been in charge for the whole season. Sherwood had a top-flight win percentage of 59%, which is the best of any Tottenham boss in Premier League history, and sixth place was enough to get the club into next season's Europa League. But there had been speculation over his future during his spell in charge, with Tottenham having to deny claims from Ajax that they contacted the Dutch club over the availability of De Boer. Sherwood also claimed he felt like a "supply teacher", with players being told by their agents he would not be at the club next season. He left White Hart Lane in 2003 and moved to Portsmouth but returned as part of the club's coaching staff in 2008 under manager Harry Redknapp. "The focus must turn on Tottenham chairman Daniel Levy after the sacking of Tim Sherwood. "The constant turnover of managers smacks of bad decision-making by Levy and eventually he will have to become accountable for what seems almost permanent instability at White Hart Lane. "Levy must get the right man for the long haul this time or his credibility will be even further eroded." "Spurs appear to be in a little bit of a dilemma," former club striker Clive Allen told BBC Radio 5 live. "Louis van Gaal seemed to be what they were looking for, but now it appears he will be taking over at Manchester United. "It's a difficult decision for Levy. Southampton manager Mauricio Pochettino is one he's said to be looking at while Roberto Martinez has done a fantastic job at Everton." Tottenham goalkeeper Brad Friedel says Sherwood showed enough in his five months in charge to suggest he has the necessary attributes to manage at the top level again. 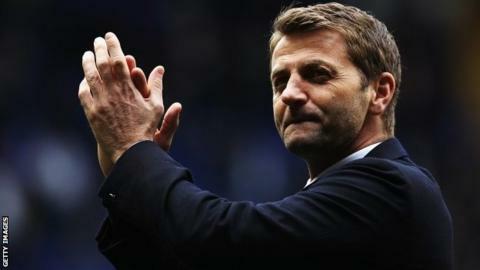 "I thought Tim, especially in his first managerial job, conducted himself very well," Friedel, 42, told BBC Radio 5 live. "His win percentage speaks for a lot, and I think he did really well - he can walk away from this with his head held high. "He is good enough to be a manager in the Premier League, whether at Tottenham or with somebody else." Friedel insists Sherwood retained the support of the dressing-room, despite the manager publicly criticising his team as "lacking guts and character" after the 4-0 Premier League defeat to Chelsea at Stamford Bridge on 8 March. "Not every manager is going to get along with every player at the club - that is impossible - but he got along with most of the players," Friedel continued. "I assure you there was no turmoil at the club on a day-to-day basis. All the players were fighting until the end."